On Sunday at PPJSHS, senior Tucker Mayes signed his National Letter of Intent to join the West Virginia State football and baseball teams. Sitting in the front row, from left, are Tommy Mayes, Tucker Mayes and Crystal Mayes. Standing in the back row are Trenton Mayes, PPHS football assistant coach Daniel Tench, assistant coach Matt Cottrill, head coach David Darst, assistant coach Dave Withrow and assistant coach Terry Rollins. POINT PLEASANT, W.Va. — Up for a challenge. 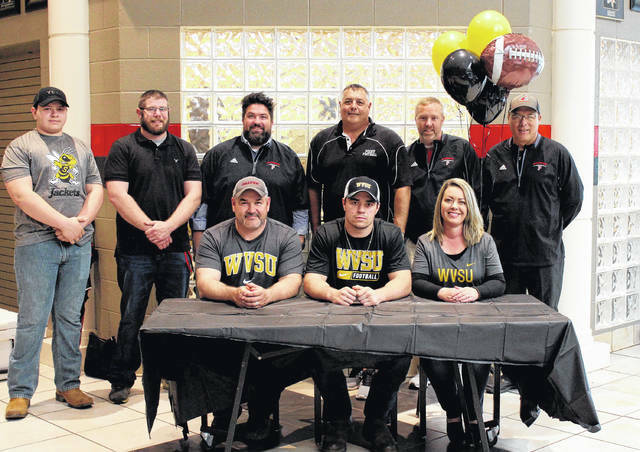 On Sunday at PPJSHS, senior Tucker Mayes signed his National Letter of Intent to join both the West Virginia State University football and baseball teams. On the gridiron, Tucker has been four-year member of the Big Blacks, starting on defense for three seasons and on offense for one. In four seasons at PPHS, Mayes has helped the team to a 42-5 record, with four straight appearances in the second round of the playoffs. Point Pleasant head coach David Darst noted Mayes’ ability to quickly adapt to football at the varsity level. As a senior for PPHS, Mayes was named a second team linebacker on the All-West Virginia Class AA list and was chosen as the Ohio Valley Publishing Super 25 Defensive Player of the Year. In his senior season, Mayes recorded 92 tackles, including 18 for a loss. He also came up with seven sacks, five forced fumbles and three fumble recoveries. On offense as a senior, Mayes — who caught touchdown passes in both of the Big Blacks postseason tilts — hauled in 32 passes for 429 yards and eight touchdowns. Mayes showed his knack for defense, and the big play, early in his high school career. As a sophomore, Tucker recovered a fumble in each the Class AAA quarterfinal and semifinal games. As a junior, Mayes picked off a pass in the opening round of the Class AA playoffs. Mayes — who’ll likely be a tightend for the Yellow Jackets — will be looking to make a smooth transition from his high school offense to the one he’ll be working in at WVSU. On the baseball field at WVSU, Mayes will look to play third base or outfield, while continuing to improve his power hitting game. Mayes is currently in his third season of varsity baseball at PPHS, and — at the time of his signing — has helped the Big Blacks to 32 victories in his career. West Virginia State is an NCAA Division II school that competes in the Mountain East Conference. Located in Institute, W.Va. WVSU is less than an hour drive for many PPHS fans looking to follow Mayes’ college career. Tucker also noted the role that former PPHS player and current Yellow Jacket, Dakotah Booth, played in getting him to West Virginia State. Mayes — who holds a 3.2 grade-point-average at PPHS — will be a Business major at WVSU.